Duration: This activity will require four class periods: 2 periods for activity one, 1 period for activities two and three combined, (each team will present on different days). The delegates will collaborate on their victory speech using the social media application PrimaryPad. Each student will need a laptop or iPad to access the Internet. 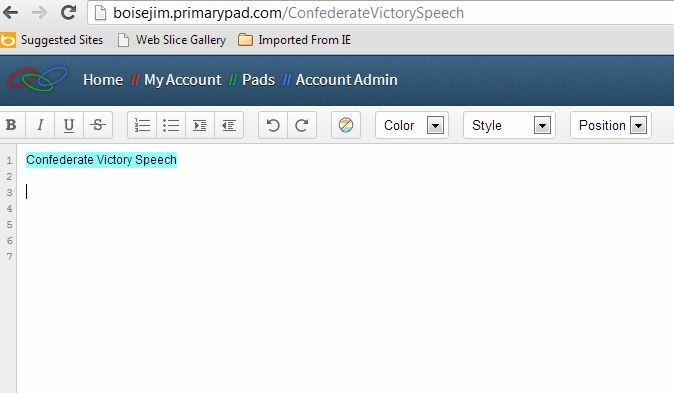 This online word processor allows students to write their speech simultaneously. As each person types, their edits appear on everyone else’s screens. Everybody can add or edit the text. Each user is assigned a unique color for their text so it is clear which student wrote it. The delegates will need to reach a consensus on the final product, much like the founding fathers of this country did with the Declaration of Independence. Students will describe in detail their position on the following two central points of the Civil War, so the rest of the world understands how this nation will go forward. Students will explain the rationale for their position, and provide supporting details to validate their claims. Is the country a confederation of sovereign states, or an indivisible nation with a sovereign national government? Are all men created with an equal right to liberty or will slavery continue? After completing their speech, students will create a five question multiple choice test that will be given to the delegates on the losing side of the war (still using PrimaryPad). Each question should have three choices, and the correct answer should be in bold text. The questions should assess if the losing delegates fully understand how the country is organized and its position on slavery. All the material needed to answer the questions must be included in the victory speech . The test will be given to the appropriate team teacher and become the foundation of the third activity. Share your message with the nation and the world using Skype. 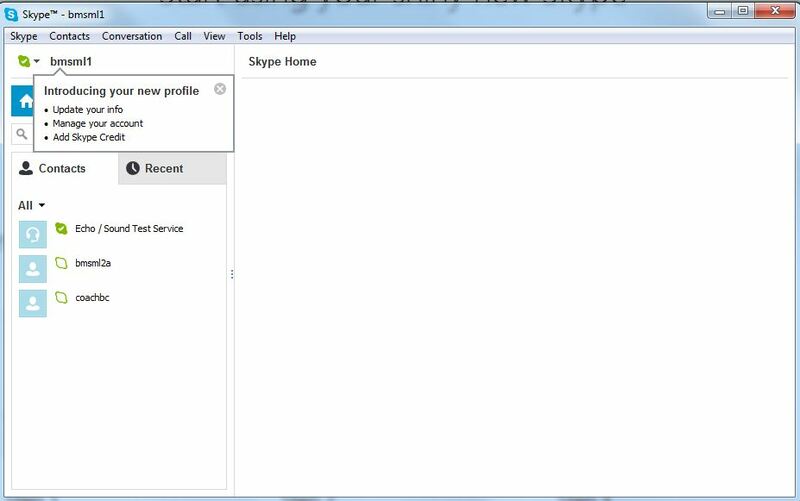 Skype is an online video sharing service. Skype is installed on the classroom computer (icon on desktop) which is connected to the projection system in each classroom. Team 51 will present first and will initiate the call to team 52. Each team teacher will login for the students to Skype using the appropriate credentials below. Once connected, each classroom will be able to to see and hear the other room. The team 52 teacher will also join the call with their faculty Skype account using their laptop. They will represent a foreign country such as Great Britain, since this broadcast is supposed to be seen worldwide. The presenting team will read their victory speech created in activity one. At the completion of the speech, the losing delegates can ask questions to clarify ideas, but this is not intended to be a debate. The teacher from Team 52 will ask 2-3 questions about how the outcome of the war will affect countries around the world. On the second day of presentations, the teams are reversed. Activity Three: Do you understand? Using the assessments made by the delegates in activity one, each teacher will create an online test using the social media tool Socrative prior to the presentations. The teacher account has already been established and a Socrative classroom has been created. Two quizzes exist (Union Victory and Confederate Victory), but the student created questions need to be copied into the body of the test. The Team 51 teacher will update the Confederate quiz, and the Team 52 teacher will enter the material for the Union quiz. 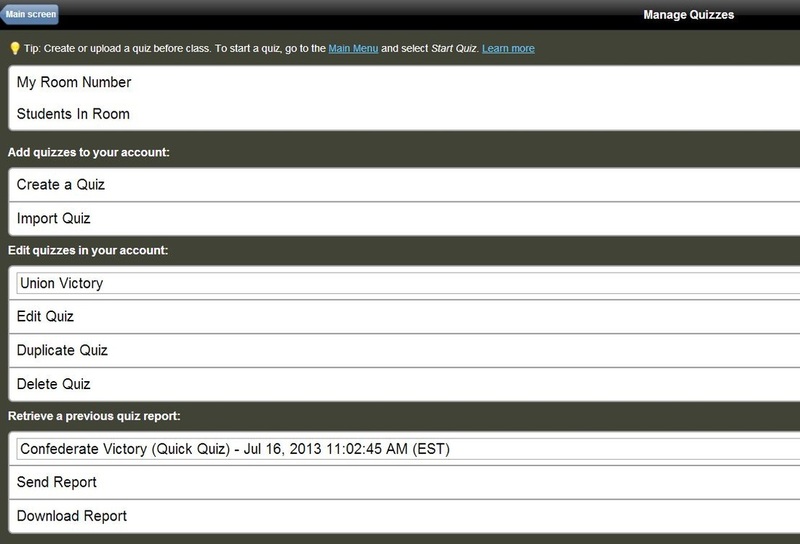 Teachers will use the same Socrative credentials which will be emailed to themfor security. The five question test will demonstrate if the losing delegates understand the rules and culture of the new society in which they will live, and if the presenters did a good job providing the necessary material and fully explained their position. Teachers and students can use Socrative on any device with a web browser (tablets, smartphones, laptops, iPod Touches, etc.). Teachers login at t.socrative.com by entering their email and password (this will be provided to you). Students login at m.socrative.com by entering the "virtual room number" 721501 Students will then see "Waiting for teacher to start an activity...". Students respond on their devices. Students' results are visible on the Teacher's screen.